Ted Wolf and Rankin and Bass created Thundercats in 1984. 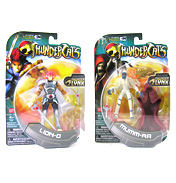 The TV shows and feature length film follow the adventures of cat like humanoid characters from alien planet Thundera and their battles with archenemies the mutants of Plun-Darr. There are many characters in the Thundercats series but Lion-o is the most important and leader of the Thundercats. He wields the sword of omens that contains the Eye of Thundera in its hilt. This is the source of the Thundercats power and often drives the evil Mumm-ra and his mutants away. The toys we provide here at WWSM include 10cm action figures of all your favourite feline heroes, a lizard cannon with firing missile and full throttle Thunderracers. We also have a claw shield and sword set so you can feel like the courageous Lion-o himself.